The pic is slightly different than the gateway site, but it should be easily returnable if it doesn't fit the wsm to a target or via mail. 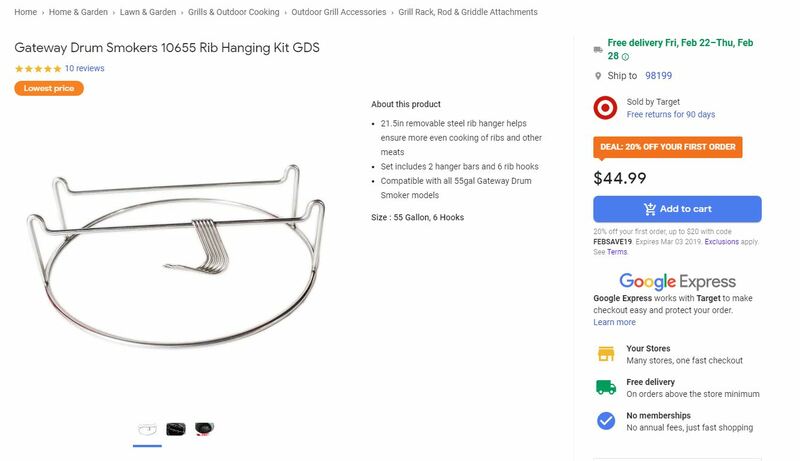 Comments on both Google and Target indicate it does fit WSM. I ordered via the google shopping site and used the code FEBSAVE19 for a 20% discount ($9.00 USD). With tax and free shipping it is ~$8.50 less than the asking price direct from Gateway before shipping, which is significant from Gateway to my zipcode. Wish they had this for the 18" as well. Thanks for the info. Been eying those for awhile. They have a smaller version that does fit the 18 WSM. It is designed for their 30 gallon drum but fits the WSM fine. My wife got it for me for Christmas. I love it! Target only seems to carry the larger one. I didn’t check GDS shipping on the 18 version, but it was $29+ for the 22”. With shipping, the Google/Target deal is about half of direct from GDS. Wish they carried the 18” too. Target is the place to get it. They ship it for free (directly from Gateway). That is true. I received this today and it came from Gateway. Also, it is the same as the current on the GDS site and not straight sided like pictured (above) on the Target site. I think including shipping and with the Google 20% off it cost about half of what it costs buying direct from GDS.